After the Loop Telecom case, the Central Bureau of Investigation has referred another 2G telecom spectrum allocation case to Attorney General G E Vahanvati, it is learnt. The bureau has now approached the attorney general on the likely charge sheet against Bharti Airtel, Vodafone India and former telecom secretary Shyamal Ghosh for spectrum allocation in the Bharatiya Janata Party-led National Democratic Alliance regime. The department of prosecution in the CBI has contradicted a few charges made by the investigative agency in its charge sheet, which hasn't been filed yet. Earlier, CBI had expected it would file the charge sheet in this case by October. However, with the latest development, the matter is not likely to see closure anytime soon. CBI's legal department had earlier contradicted the findings on cross-holdings of Essar shares in Loop Telecom, contending there was no case against the company. Following this, the matter was referred to Vahanvati. On November 19, 2011, CBI had registered a first information report against Bharti Cellular (now Bharti Airtel), Hutchison Max & Sterling Cellular (now Vodafone Essar) and Ghosh for criminal conspiracy, under the Prevention of Corruption Act, 1988. The FIR detailed how Shyamal Ghosh, then telecom secretary, had bypassed the wireless advisor and a technical committee of the department of telecommunications on the issue of pricing and the allocation of additional spectrum to telecom companies. Ghosh, along with a few other DoT officials, had caused a loss to the exchequer and a gain to Bharti Airtel and Vodafone, the FIR said. 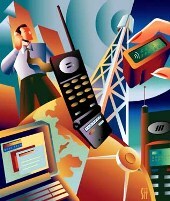 In the FIR, CBI had alleged Ghosh, along with then deputy director general of telecommunications J R Gupta and the beneficiary companies, had approved the allocation of additional spectrum of up to 10 MHz at minimal incremental revenue share, though according to the recommendations of the technical committee, even 8 MHz wasn't justified. CBI said this had led to an "undue pecuniary benefit of Rs 506 crore" to the beneficiary companies, adding this should have gone the DoT's way. Now, pesky messages bother the Telecom Minister!